Nicholas Dawidoff is the author of The Catcher was a Spy: The Mysterious Life of Moe Berg and In the Country of Country: A Journey to the Roots of American Music, and is the editor of the Library of America’s Baseball: A Literary Anthology. He is also a contributor to The New Yorker, The American Scholar, and The New York Times Magazine. A graduate of Harvard University, he has been a Guggenheim Fellow and a Berlin Prize Fellow of the American Academy. He and his wife live in New York. 1994-07-06. New. Ships with Tracking Number! INTERNATIONAL WORLDWIDE Shipping available. Buy with confidence, excellent customer service! 1995-08-06. New. Ships with Tracking Number! INTERNATIONAL WORLDWIDE Shipping available. Buy with confidence, excellent customer service! 2016-07-08. Good. Ships with Tracking Number! INTERNATIONAL WORLDWIDE Shipping available. May not contain Access Codes or Supplements. May be ex-library. Shipping & Handling by region. Buy with confidence, excellent customer service! 2016-07-08. New. Ships with Tracking Number! INTERNATIONAL WORLDWIDE Shipping available. Buy with confidence, excellent customer service! NY: Pantheon, 1994. Book. As New. Hardcover. 1st Edition. Pantheon. Hardcover. 0679415661 New Condition. . New. 1995-08-06. Good. Ships with Tracking Number! INTERNATIONAL WORLDWIDE Shipping available. May not contain Access Codes or Supplements. May be ex-library. Shipping & Handling by region. Buy with confidence, excellent customer service! New York: Pantheon, 1994. Book. New. Hardcover. 1st Edition. No Flaws or Blemishes; Gift Quality. Third Printing. ----------- Baseball catcher, lawyer, and spy-Moe Berg was all of these, but first and foremost he was an enigma. All the ascertainable facts concerning Berg's life are presented here, including his 19 years as the most famous journeyman catcher in professional baseball. 1994-07-06. Good. Ships with Tracking Number! INTERNATIONAL WORLDWIDE Shipping available. May not contain Access Codes or Supplements. May be ex-library. Shipping & Handling by region. Buy with confidence, excellent customer service! VINTAGE. New. 7.98 x 5.16 cm. Pantheon. Hardcover. 0679415661 Like New Condition. . Fine. New York: Pantheon Books, 1994. Fourth Printing. very good, good. 453, illus., notes, bibliography, index, some wear to top and bottom DJ edges. Moe Berg played in the major leagues from 1923 through 1939; after Pearl Harbor, he worked for the OSS in determining Germany's atomic bomb capability. Pantheon Books, 1994. (5th) DJ and book, both Very Fine.. Hard Cover. Fine/Very Fine. Vintage Books. Reprint. Biographies & Memoirs. New. Brand New: This item is brand new unopened, never used and still in its original manufacturer condition. Vintage. PAPERBACK. 0679762892 Special order direct from the distributor . New. Vintage. PAPERBACK. 0679762892 Remainder mark . Fine. New York, NY: Vintage, 1995. Book. Very Good+. Soft cover. Later Printing. Minor wear; otherwise a solid, clean copy with no marking or underlining; collectible condition; illustrated with black and white photographs..
Vintage. PAPERBACK. 0679762892 Minor shelf wear . Very Good. Vintage, 1995-05-30. First Vintage Book Edition. Paperback. Used:Good. New York: Pantheon Books, 1994. 453pp., unpaginated (16 page) candidly-illustrated b/white halftone plate section. Book clean. Bright gilt title on mildly cocked, green, quarter-cloth spine. Leaves clean. Illustrated, loose-plastic protected dustjacket price-clipped, and lightly edgeworn only. The story of American baseball player Morris 'Moe' Berg, an enigmatic, highly-educated, intelligent character who played in major leagues from 1923 through 1939, then became coach for the Boston Red Sox. Multi-lingual, he was also a spy . . . Contents include: Prologue, 14 chapters, Notes, Biblio., Index. Book weight approx. 720g. . First Edition, 2nd Impression.. Hardcover and Dustjacket. Very Good/Very Good. 8vo - over 7¾" - 9¾" tall. Edition: First Edition, 2nd Impression. New York, New York, U.S.A.: Vintage Books. New. 1995. Soft Cover. 8vo - over 7¾" - 9¾" tall 0679762892 NEW BOOK . Vintage. PAPERBACK. 0679762892 *BRAND NEW* Ships Same Day or Next! . New. Vintage. PAPERBACK. 0679762892 *LIKE NEW* Ships Same Day or Next! . Fine. Vintage. Paperback. 0679762892 . New. 1995-05-30. Reprint. Vintage. PAPERBACK. 0679762892 . New. New York, New York, U.S.A.: Vintage Books, 1995. Fine in Fine jacket 8vo-over 7Â¾"-9Â¾" tall. pp.453 with index and bibliography. Much more than a baseball player between 1923 and 1939 who became an OSS spy in Europe during WWII. clean tight copy, minuscule edgewear.. First Vintage Books Edition. Soft Cover. Fine. NEW YORK: VINTAGE BOOKS / RANDOM HOUSE. VG IN WRAPS. LIGHTLY WORN. Pages: 453. . 1995. 9TH. TRADE PAPERBACK.. Condition: VG IN WRAPS. LIGHTLY WORN. Pages: 453. New York, NY, USA: Pantheon Books, 1994. Sixth Printing. Hard Cover. Very Good/Very Good - In Brodart. Brief summary of content available upon request by e-mail. Pantheon Books, 1994. Illustrated. Hard cover. Fine in fine dust jacket. A Fine Copy In Fine Dust Jacket. Sewn binding. Cloth over boards. 453 p. Contains: Illustrations. Audience: General/trade. Vintage. PAPERBACK. 0679762892 signs of little wear on the cover. . Very Good. Vintage. PAPERBACK. 0679762892 BRAND NEW, GIFT QUALITY! NOT OVERSTOCKS OR MARKED UP REMAINDERS! DIRECT FROM THE PUBLISHER!|1.03 . New. NY: Pantheon. Good in Good dust jacket. 1994. Third Printing. Hardcover. 0679415661 . Fore-edge has been scraped about half-way down from top of book, all the way across text block, resulting in slight wrinkles to pages along outer margins. Slight soil to top edge. ; Illus. , jacket (not price-clipped) now in a clear protector ; 453 pages . Pantheon Books, 1994. 1st Edition Later Printing. Hardcover. Very Good/Very Good. 8vo - over 7¾ - 9¾" tall. Very Good/Very Good condition. First edition, later printing. No markings to the text block. No marks of personal identification or prior ownership. Mississauga, ON, Canada: Random House of Canada, Limited, 1994. Book. Very Good. Hardcover. EIGHTH PRINT. 8vo - over 7¾" - 9¾" tall. BLACK SPINE ON DUST JACKET. 455 PAGES. PHONE NUMBER WRITTEN INSIDE REAR COVER. BOOK IS CLEAN, BRIGHT AND SECURE. Random House of Canada, Limited. 1994, 8TH PRINT. 8vo - over 7¾" - 9¾" tall. Pantheon, 1994-06-28. Hardcover. Very Good. NY: Vintage. G PB. (1994). 1st ptg. One of the strangest episodes in the history of espionage. Moe Berg's baseball card is the only major league baseball player . on display at the CIA. He became an OSS spy in Europe during WWII. Few page corners creased. .
New York, New York: Vintage Books, 1995. Reprint. . Soft cover. Very Good. 8vo - over 7¾ - 9¾" tall. Very Good condition, no DJ. Reprint. No markings to the text block. No marks of personal identification or prior ownership. Pantheon Books, 1994. 1st Edition Later Printing. Hardcover. Very Good/Very Good. 8vo - over 7¾ - 9¾" tall. Very Good/Very Good condition. First edition, later printing. No markings to the text block. No marks of personal identification or prior ownership. Dust jacket price clipped. New York: Vintage Books, 1995. (1995), 453pp, illus., light edge ding to rear cover, contents clean.. Trade Paperback. Very Good +/No Jacket. Random House Inc, June 1995. Trade . Very Good. Very Good Softcover. Light soiling and shelfwear to covers. Pages clean and tight in binding. Pictures available upon request. A locally owned, independent book shop since 1984. Vintage Books, 1995 1st edition thus. Trade pb, Octavo, 453pp, illustrated. 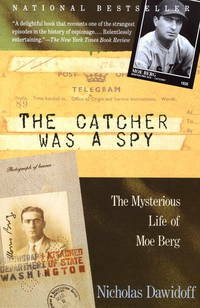 WW II spy and former major league ball player, Moe Berg. VG in pictorial wraps.. Seller: Banks Books & Etc. Pantheon. Used - Good. Former Library book. Shows some signs of wear, and may have some markings on the inside.